Lets discuss the pink elephant in the room. 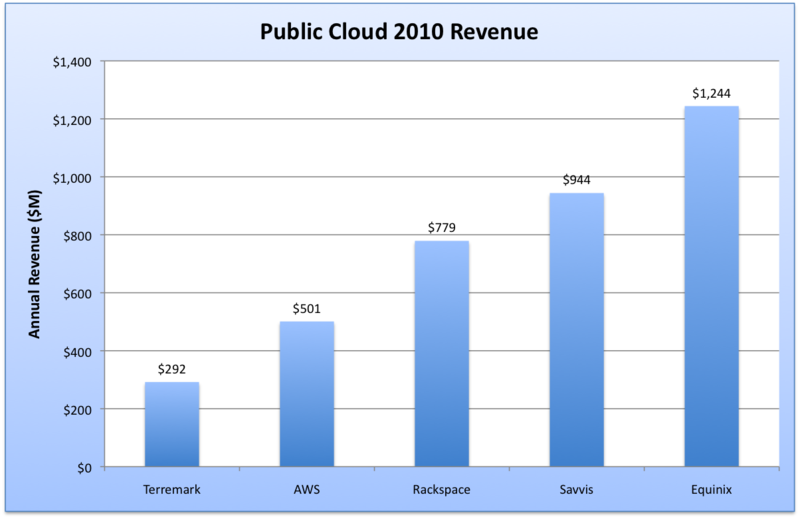 You can segment “Public” cloud revenue into SaaS and IaaS revenue components. Many people think of Infrastructure as a Service (IaaS) when they think of Public Cloud. Analysts bundle the Salesforce’s of the world together with those providing infrastructure on demand (aka Amazon). 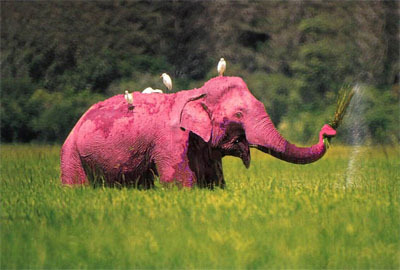 Lets first look at the Public IaaS pink elephant. When we look at the leader in the space, Amazon Web Services, we see a company who has transformed the computing landscape and essentially launched what is generically known as the cloud computing industry. By turning expensive storage and computing hardware into a billable service, it has opened up new vistas for entrepreneurs and made corporations rethink how they build and use their computing and storage resources. The question often people ask: How much money is Amazon making from these web services? UBS Investment Research analysts Brian Pitz and Brian Fitzgerald released a report which projects revenue numbers against Amazon’s web services (see thumbnail to the left). The duo estimate that in 2010, AWS will generate about $500 million in revenues and will grow this number to $750 million by 2011. 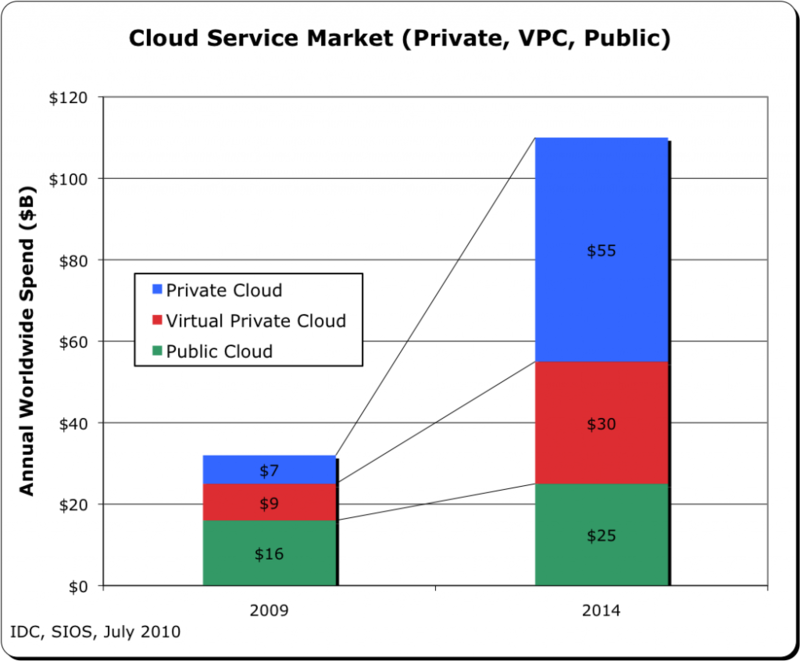 IDC says the total global cloud market in 2010 will be $22 billion and $55 billion in 2014 (this is public cloud). Lets look at a list of the competition in the Public IaaS space. Some of these vendors, like Equinix, provide network neutral data center services to enterprises, content providers, financial services companies, and network service providers. Therefore, “public cloud” or compute/storage/network on demand is an emerging part of their traditional co-location or managed services. But in any case, it’s “eye-opening” when you look at the revenues of some of the leaders in the space. Amazon is only $500M in annual revenue because they power some 60K small enterprises (“two men in a shed”) who have dreams of becoming large companies. This is the “long-tail” of enterprise who can’t afford to purchase servers and manage them at a co-location data center. When you think of “cloud” you need to think “Private Cloud”. OK. So lets really get that pink elephant on the table. You can use compute + storage + networking hardware/software revenue projections as they apply to powering the automated data centers (this is HW/SW sold each year for the “public clouds”..whether IaaS or SaaS) vs. the traditional non-automated data center. 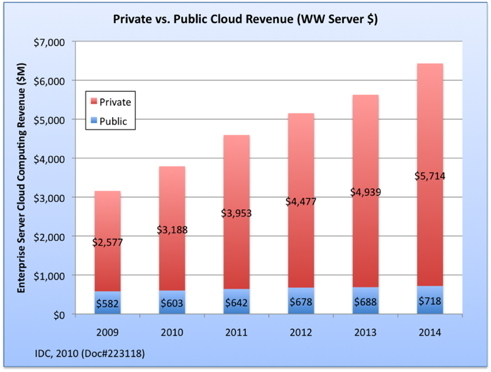 Lets take the most recent IDC report on server sales into private versus public cloud infrastructure. This is a reasonable “relative” and accurate indicator of private vs. public (not absolute revenue numbers). In other words, how many servers are being purchased by big enterprises to power their internal data centers versus how many servers are being purchased to power external public on-demand infrastructure? The truth in spend is definitely interesting. If I were a new startup or a new line of business, I’d definitely consider the fact that in 2010, the ratio of new systems being sold to build/power for private vs. public was better than 5 to 1. The private cloud server revenue is forecast to grow at 17% CAGR to $5.7B in 2014, and the public cloud server revenue at 4.3% CAGR to $718M. Where would you want to place your bet? Here’s a rough crystal ball in terms of these three important categories. Again, I’d prefer to spend my money in the Private Cloud arena. Only issue with this….it will require that you know how to sell into large enterprise….not the small to medium sized businesses or the long-tail.